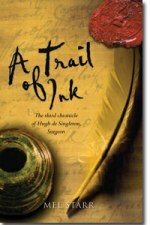 It makes me more than happy to know that A Trail of Ink by MEL STARR is a series. This novel is the third book in the series involving Hugh de Singleton, a surgeon. In this Medieval mystery Hugh de Singleton becomes wrapped up in a world of intrigue and also, jealousy. The surgeon learns of a friend's lost books. There are twenty-two books missing. Just imagine what this meant in the world at that time. During this era books were truly treasures to own. The missing books belong to John Wyclif. Hugh who reminds me of a gallant gentleman agrees to hunt for the books. To help him along the way he takes his loyal groom, Arthur.